Ready to sign Medicare reform legislation and hand it to voters, President Bush asked lawmakers to quickly resolve their differences and offer America's seniors prescription drug coverage for the first time in the program's 38-year history. "The Congress must now pass a final bill that makes the Medicare system work better for America's seniors," Mr. Bush said in his Saturday radio address taped before he arrived at his Texas ranch for the weekend. "This is an issue of vital importance to senior citizens all across our country. They have waited years for a modern Medicare system and they should not have to wait any longer." The Medicare bill that the GOP-led Congress is about to pass only resembles Mr. Bush's initial plan, yet if Congress completes it and Mr. Bush signs it, the White House likely will get credit. That will represent a victory for a party that has traditionally been disadvantaged to Democrats on Medicare. But all indications are that could be tricky, as House and Senate negotiators will have to overcome differences between the versions of legislation they have passed. The New York Times reports Congressional leaders expects talks to last weeks if not months, and are worried that the one-vote majority that approved the bill in the House might evaporate if the House –Senate compromise includes substantial changes. Mr. Bush has made a strategic decision not to take sides in the debate and is not setting a deadline, reports CBS News White House Correspondent Mark Knoller. White House press secretary Ari Fleischer suggested the president would sign anything the conference committee produces. "The president didn't get everything he wanted in either the House or the Senate bill, but he got much of what he wanted," he said. At the same time, the Senate republican leader sounds unwilling to be rushed. "At this juncture, we've got to get this right. We can't afford to make mistakes or miss any details. We've got to take the very best policies," said Sen. Bill Frist, R-Tenn. Both houses approved the legislation early Friday in sessions that ended after midnight at opposite ends of the Capitol. Later, the top Republican leaders in Congress dampened talk of a quick compromise on the legislation as they confronted issues ranging from the details of a prescription drug benefit to a dispute over lower-cost generic drugs to proposed free-market measures. The president and his allies on Capitol Hill seem aware of the risks and rewards involved. Getting a prescription drug benefit for Medicare would be a major policy achievement. But making changes in Medicare is conceded to be political risky business, especially since it affects a group of Americans that turn out consistently in large numbers to vote. The president wanted and got private Preferred Provider Organizations (PPOs), a form of managed care added to Medicare. "When health care plans compete for their business, seniors will have better, more affordable options for their health coverage," Mr. Bush said. "Under the provisions of both the House and Senate bills, seniors who want to stay in the current Medicare system will have that option, plus a new prescription drug benefit," he said. But compromise over the specifics of the plan might be hard because both sides feel they have already surrendered much on the issue of private involvement. Rep. Harold Ford Jr., D-Tenn., used the Democratic radio address on Saturday to criticize the GOP-crafted legislation in the House, saying it would jeopardize Medicare by forcing it to compete with private health plans. At the same time, many conservatives are upset that the president didn't fight harder for introducing more private competition into the program. Mr. Bush initially wanted the PPOs to offer more generous drug benefits than traditional Medicare, as an inducement to seniors to switch to the private plans. 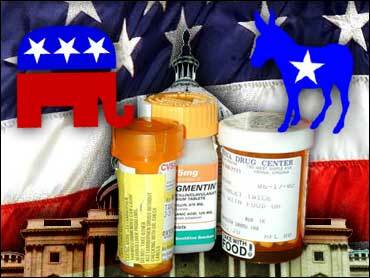 The president eventually compromised with Democrats to offer similar drug coverage under public and private plans.